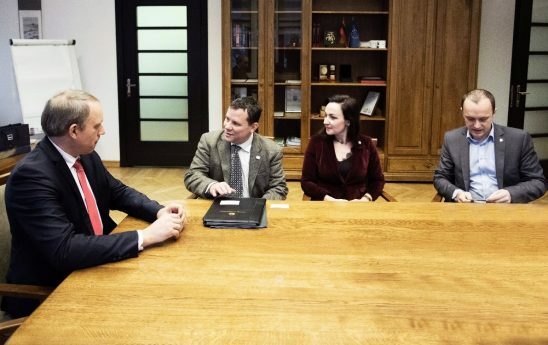 UCF Professor of Public Administration Thomas Bryer (second from left) meets with KTU Rector Eugenijus Valatka, Associate Professor Eglė Vaidelytė and Vice-Rector Jonas Čeponis in Lithuania. UCF is partnering with Kaunas University of Technology in Lithuania to offer dual bachelor’s degrees in nonprofit management from UCF’s School of Public Administration and public administration from KTU in four years. The transdisciplinary, global reach of the program will impact students at both universities, as well as the communities they serve. Bryer has worked closely with KTU officials, students and professors since 2014. He was a Fulbright Scholar living for two months each fall from 2015-2017 in Lithuania to conduct research on citizen participation with municipal governments. Today, Bryer leads a research project at KTU, with funding from the Lithuanian Science Council, focusing on non-economic factors of emigration from the country. Modern history of Lithuania includes its occupation during World War II by Germany, and following the war, by the Soviet Union. Soviet occupation lasted for 45 years, until Lithuania declared independence in 1990. Lithuania is part of the European Union and maintains a population of approximately 3 million people. Geographically, Lithuania neighbors Poland, Latvia and Belarus. Eglė Vaidelytė, lead program designer and associate professor at KTU, says the agreement provides a unique opportunity for students to expand their studies. Before this program, the two universities signed another landmark agreement. Erasmus+ is a European-funded exchange program that supports students studying at partnering universities for up to one year and allows professors and staff to visit for teaching or professional development. Under the new dual degree agreement, students obtain undergraduate degrees from both universities, expanding opportunities for international interaction and understanding. The first cohort will study together at UCF in Spring 2022 and in Lithuania the following semester. New cohorts will study at both universities each spring and fall thereafter. “In fifty years, I hope our successors remember this semester as the start of a long-lasting and globally recognized program built on a partnership that started with a simple idea. We can improve studies, research and lives by breaking down some walls and opening our doors,” says Bryer.